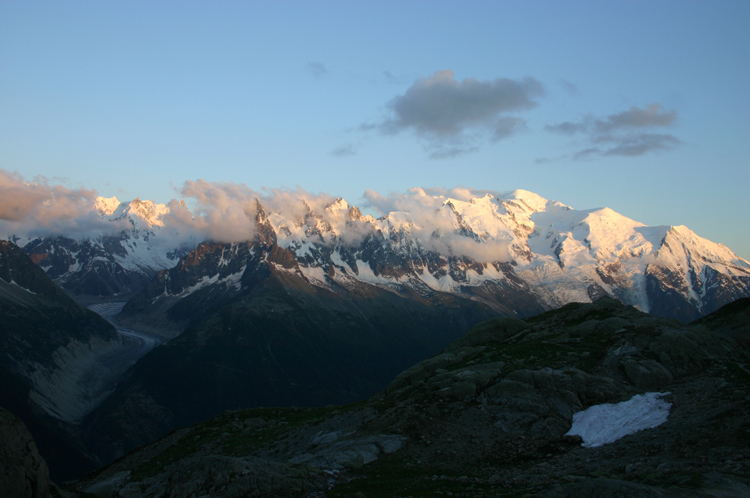 The magnificent Aiguilles Rouges, named for their reddish colour in early morning light, lie to the north-west of the Mont Blanc massif. 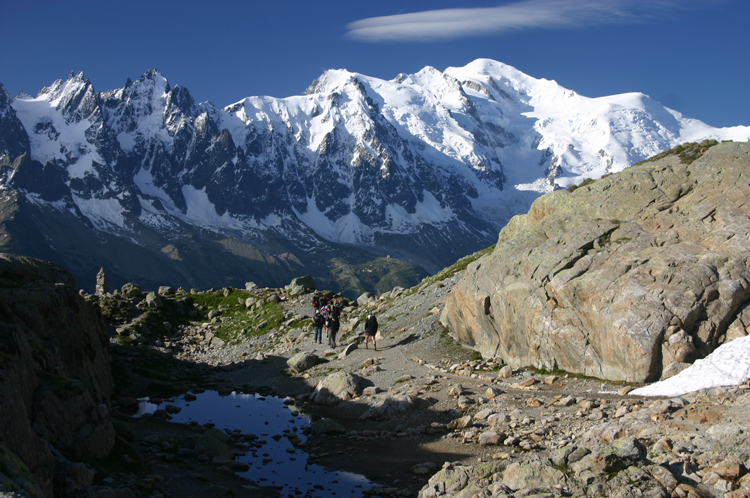 Their popular south-eastern slopes provide spectacular vistas across to the illustrious Mont Blanc. The centre of the range is harsh, brutal and empty. 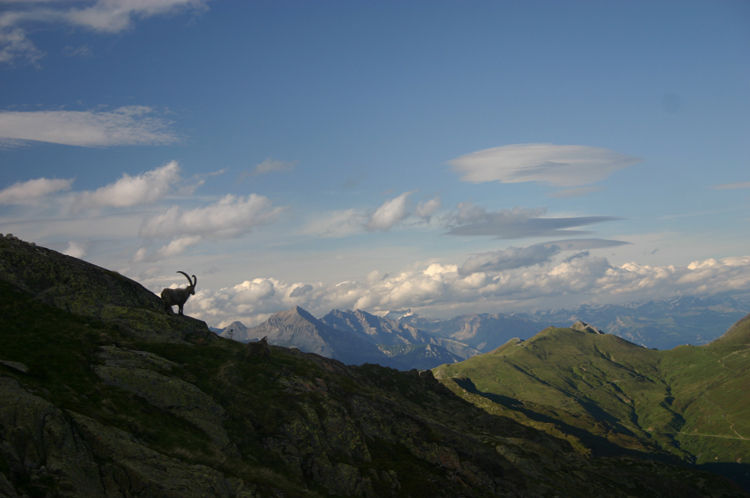 A range of walks of varying lengths (multi-day to a few hours) show off the fabulous alpine scenery of this pristine natural reserve. 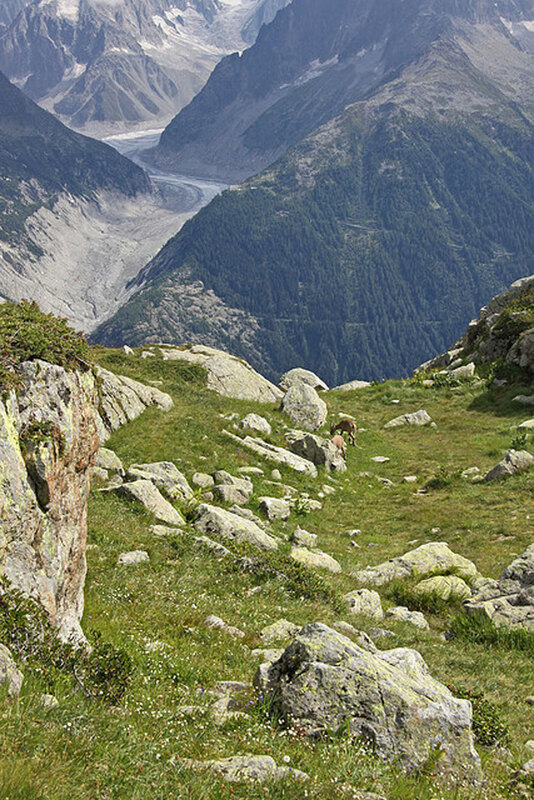 During the summer months the popularity of the area means that most of the walks are crowded (particularly around Lac Blanc) - if you are after isolation, then you'll have to go further afield. These are serious mountains, so come prepared. 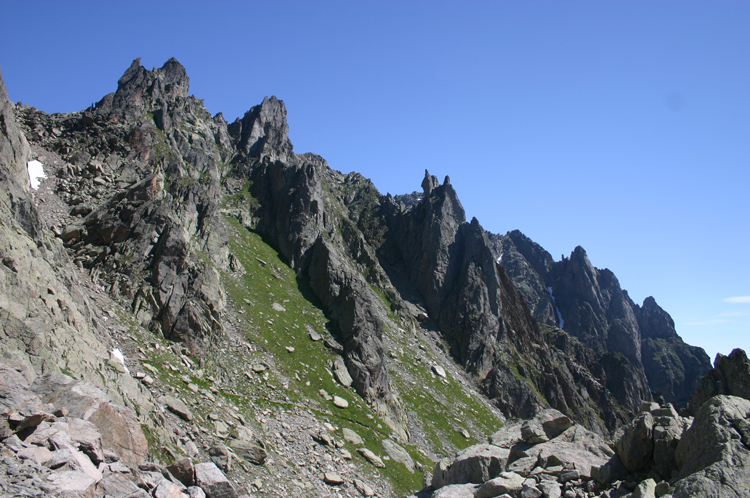 The Aiguilles Rouges gained their name (the "red needles") from the glowing red of their iron-infused granite spires in the morning light. 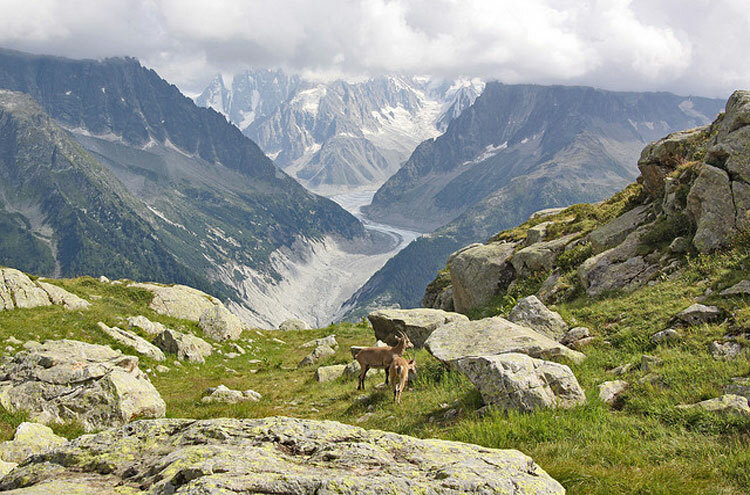 This relatively small range lies across the deep Chamonix valley to the north of the huge Mt Blanc massif with its glaciers and wildly broken ridges surmounted by serene permanent snows. 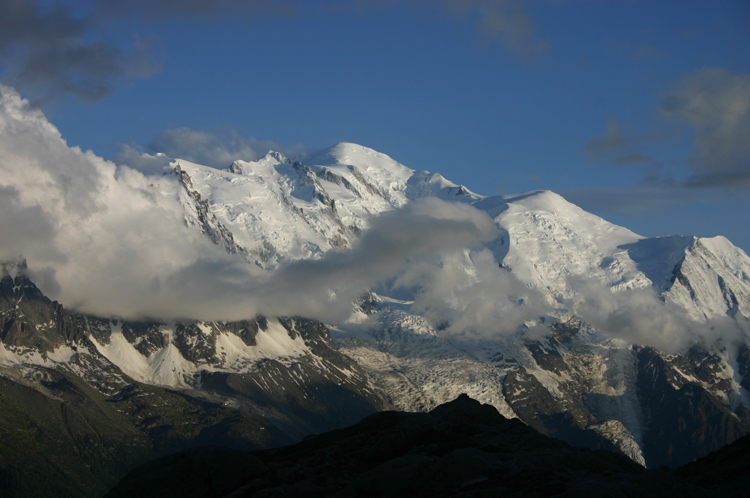 With dramatic serrated ridges and wonderful scenery of their own, they also command outstanding views of Mont Blanc. 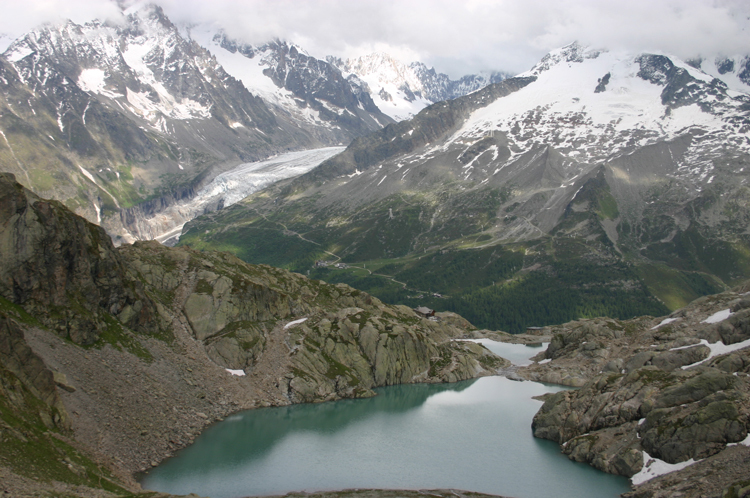 The Aiguilles are riddled with beautiful tarns, including the famous Lac Blanc at the foot of Belvedere. 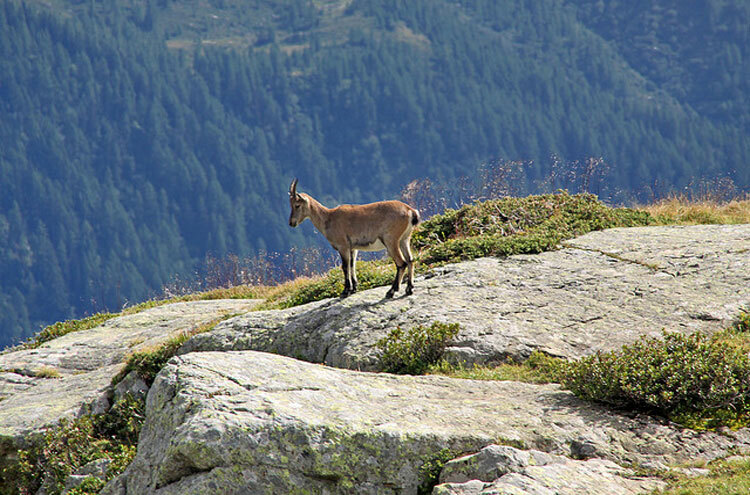 Typical alpine vegetation alongside orchids and other less common flora, and surprisingly un-shy ibex (especially around Lac Blanc), further enhance the excitement. 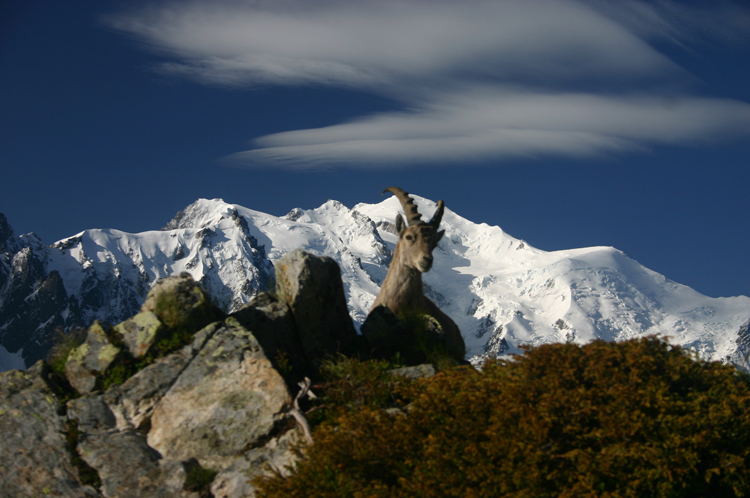 An Aiguilles Rouges Nature Reserve was created in 1972. 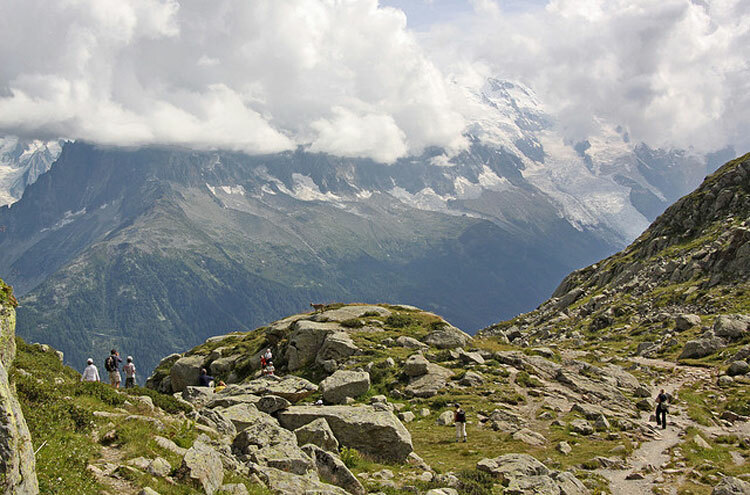 Unsurprisingly, tourists flock here in peak season, and the area - particularly the slopes above Chamonix - is packed with walkers throughout the high summer. In order to enjoy some peace and quiet, seek out more isolated walks (that, during high season, can be few and far between). 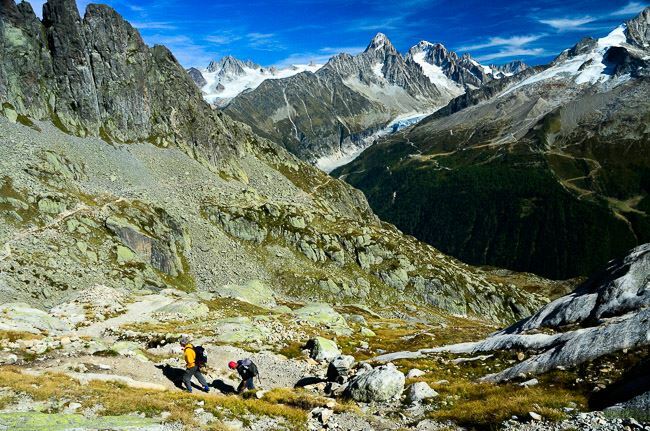 For the more adventurous, in search of an antidote to the busy slopes on the steep but (relatively) gentler southern face of the range, the areas further from Chamonix offer opportunities for more isolated exploration. 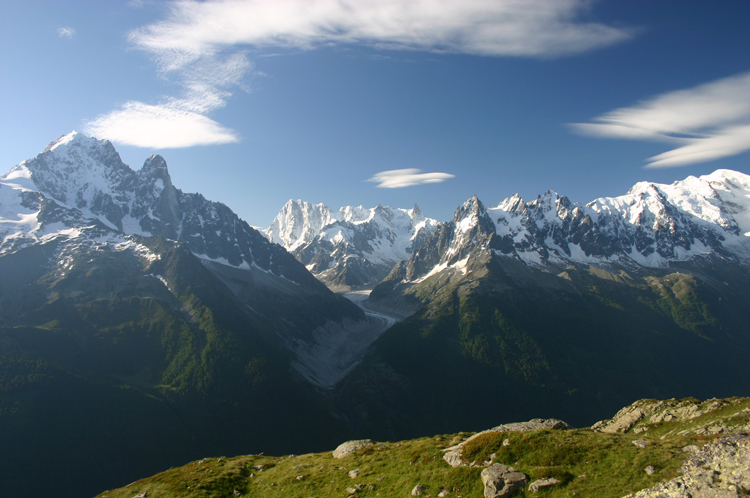 The best way to discover the area, however, is a balanced combination of the two, offered by the unofficial 'Tour of the Aiguilles Rouges'. 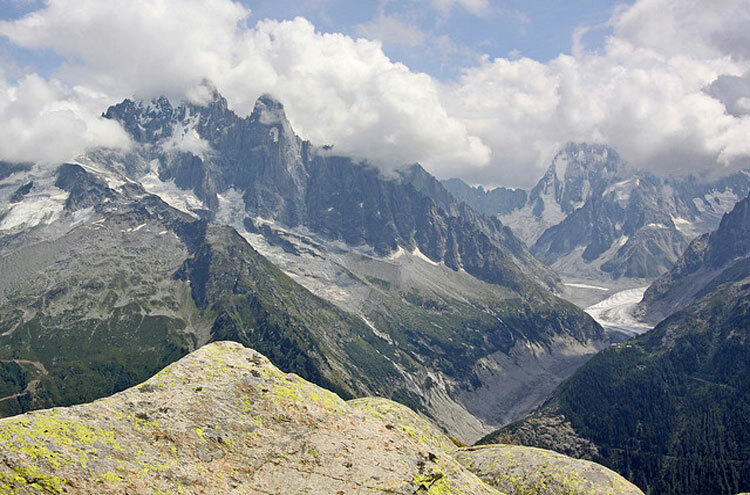 Tour of the Aiguilles Rouges (4-6 days): There are a number of ways of creating a circuit through the best of the Aiguilles. The one described here begins and ends in the hamlet of Le Buet. 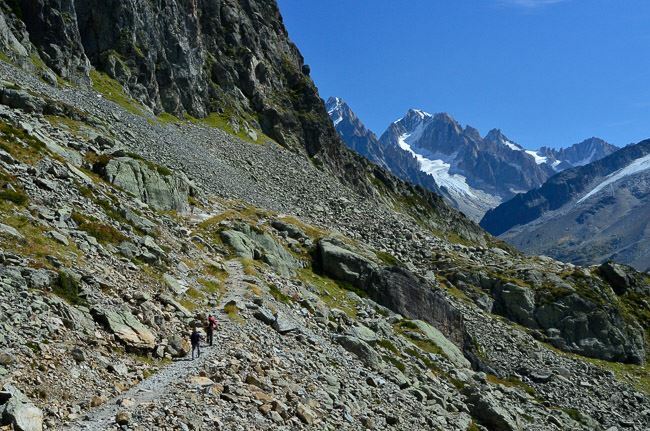 Crossing the Col des Montets pass and making your way to Lac Blanc on the first day, you can stay overnight here and so enjoy it at its best - in the early morning before the first day-walkers start to arrive. 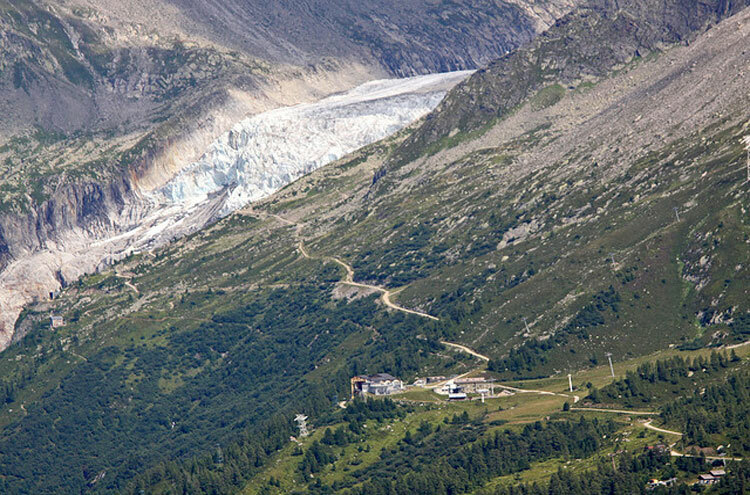 The walk from here leaves behind the lifts and ski runs scarring the mountain side, later reaching the Col de Brévent and so entering the more isolated areas of the trail, away from the Chamonix valley. This night can be spent in the Refuge Chalet Moede d'Anterne (or Refuge du Col d'Anterne, depending on your map), and an extra day here to explore is often well worth it. 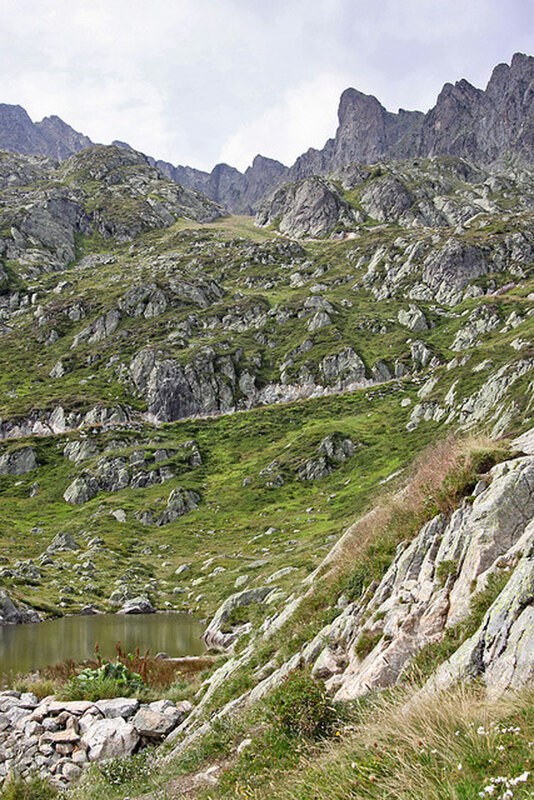 The next day's walking is more remote and more rugged than before, and finishes with a substantial climb, which you need to leave enough time and energy to complete. 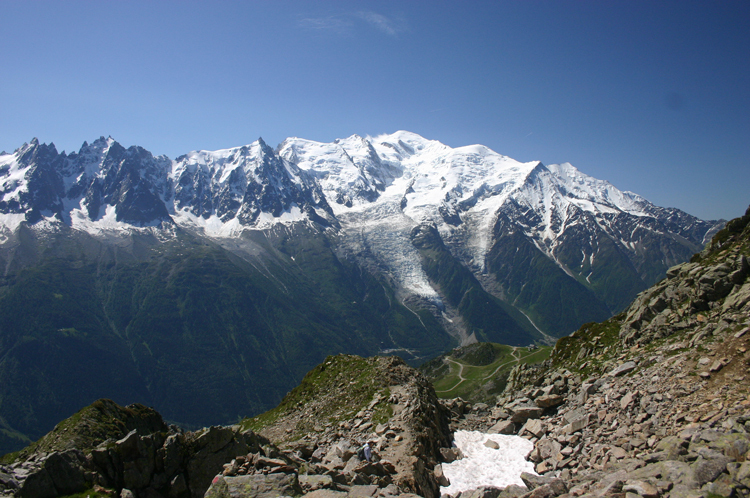 The final day is the climb up Mont Buet (see below) - this is fairly difficult, and hard work; you are amply rewarded, though, by the fabulous 360 degree views from its summit. 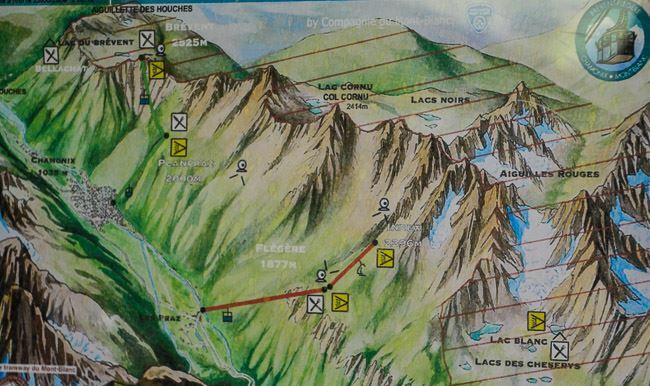 The route for this walk is described in detail, including a basic map, in Trekking Atlas of the World (Ed. Jack Jackson) and is also proposed in the Cicerone book. Tour du Pays du Mt Blanc, a shorter but varied 'official' circuit around the popular south-eastern slopes and remote interior. 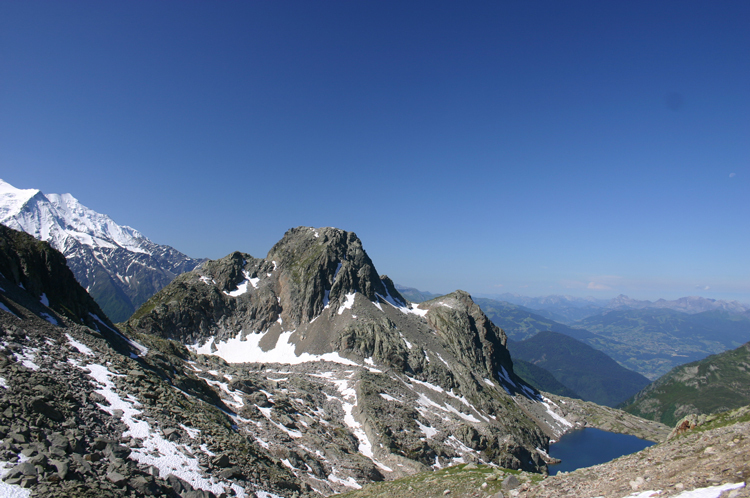 Mont Buet (2 days): There are various ways to tackle Mont Buet. The classic approaches from the north are two day walks. 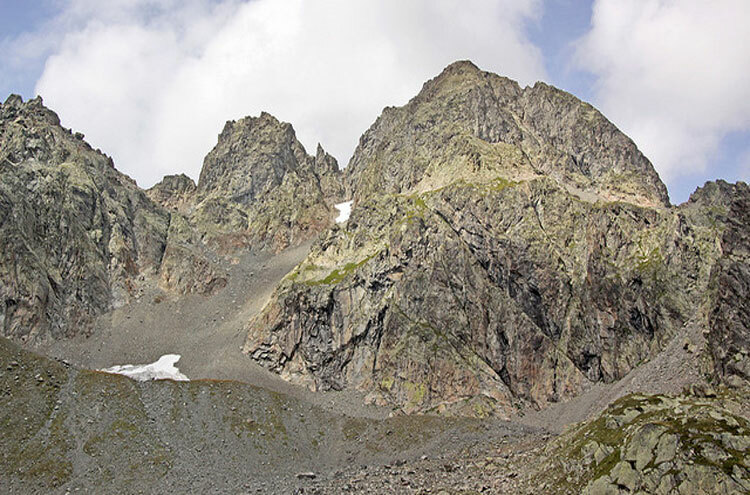 The first day is a walk from Le Buet up the Cabane du Vieux Emosson or the Refuge de la Pierre y Bérard, the latter approach up a particularly pretty valley. The second day begins early along long and arduous paths to the summit. 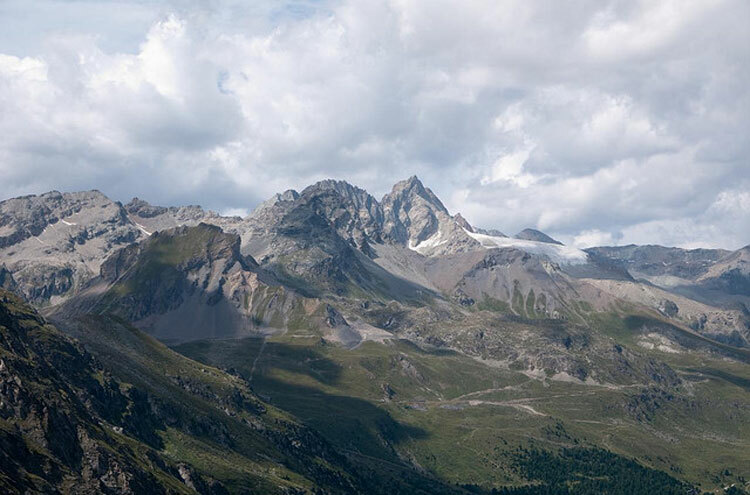 This is a long and tiring day but the views more than repay the pain (The Cicerone says "I defy anyone to find a walk more beautiful than that from The Vieux Emosson to the summit of Mont Buet in good weather"). Then retrace your steps - or follow the other route out. 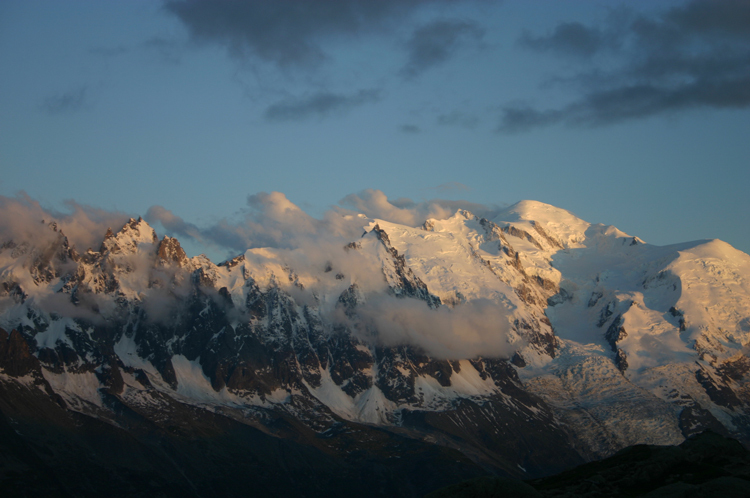 Mont Buet is known locally as Mont Blanc chez les Dames (The Ladies' Mont Blanc). Tete de Villy (2 days): The western Col d'Auterne is very popular, with superb views and scenery. The great GR5 route passes over it. 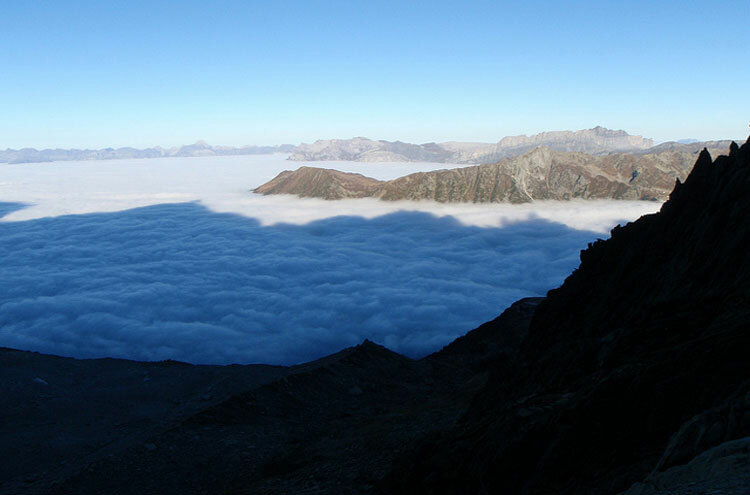 The nearby 2,451m Tete de Villy is lovely - and relatively lonely. The Cicerone has a wonderful-sounding 2 day walk from Le Brevant to here, overnighting at the Ref. du Col d'Auterne. 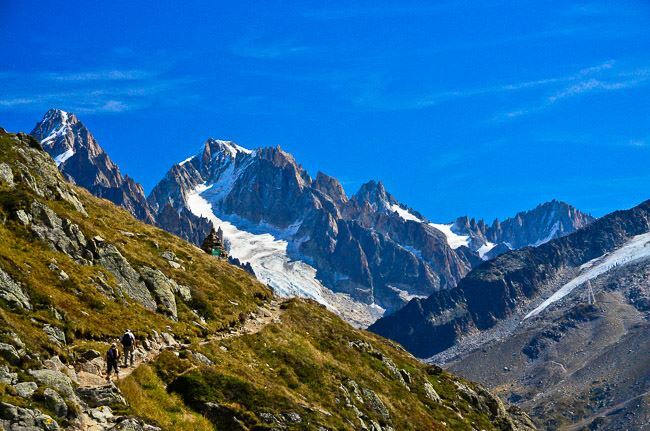 Lac Blanc: a 3-4hr trail to a beautiful pair of milky blue lakes with classic views across to the vast Mer de Glace glacier and the soaring Aiguille Vert sections of the Mont Blanc massif. 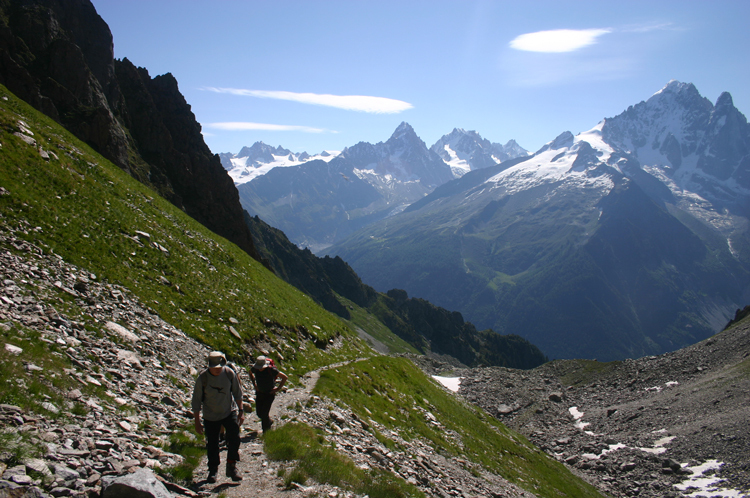 This is the Aiguilles' best known walk, and commensurately crowded in high season. 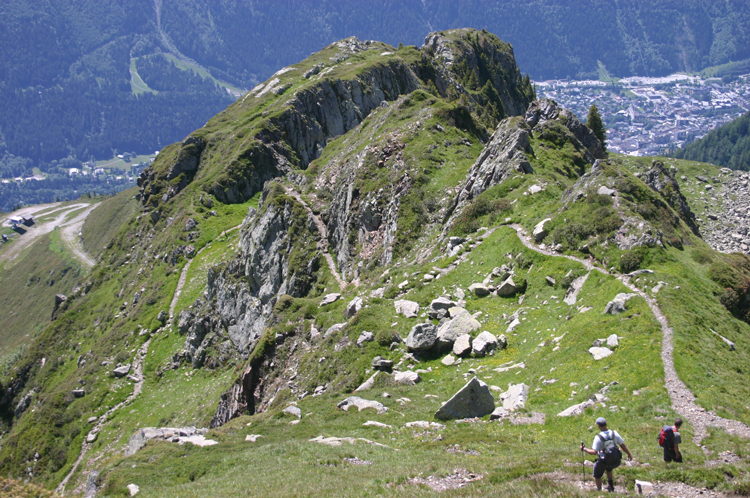 The trail begins at the top of the La Flégere cable car, and heads steadily upwards. 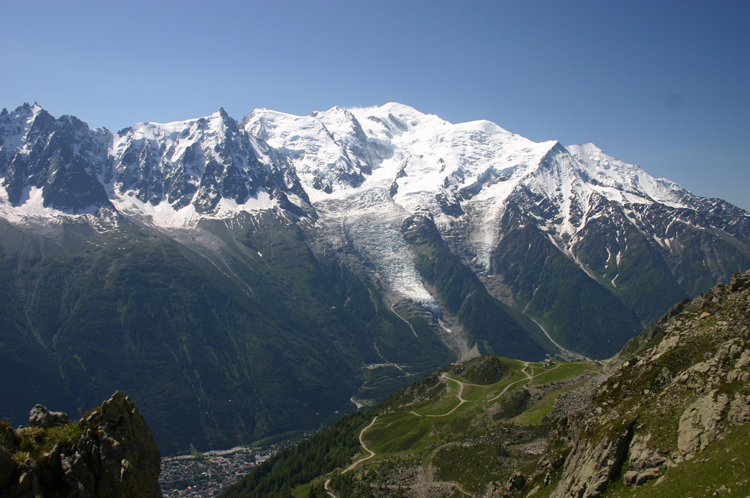 There are fantastic views of Mont Blanc and the surrounding area. 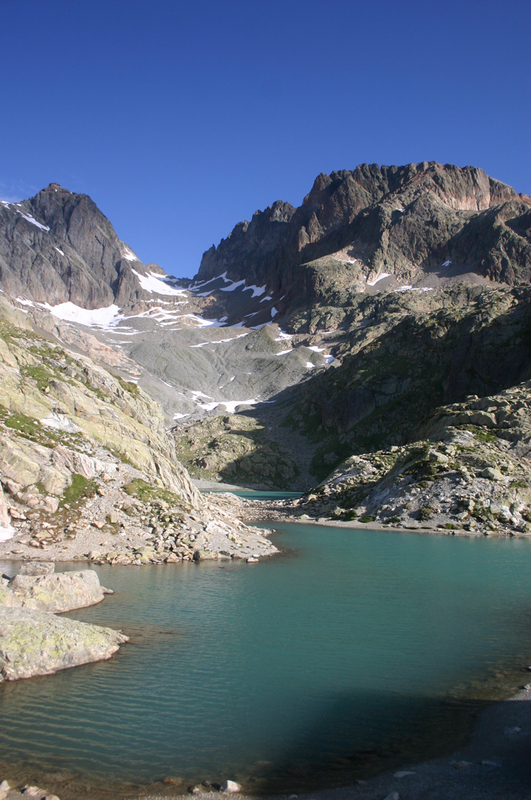 Walk back along a superb ridge between lovely tarns, south-eastward to the Grand Balcon walk, and return to Flégere. (Better still, walk this circuit in reverse.) Stay a night in the slightly cramped refuge - but book well ahead. 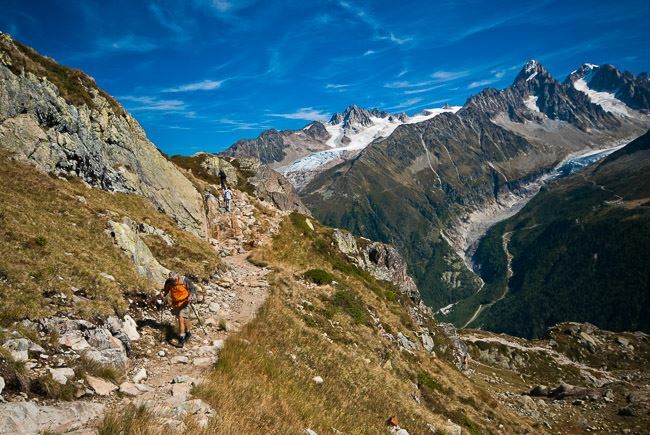 The Grand Balcon Sud, a long and very satisfactory contour-hugging trail which, because it is also part of the Tour du Mont Blanc and Tour du Pays du Mont Blanc trails, can get overcrowded. 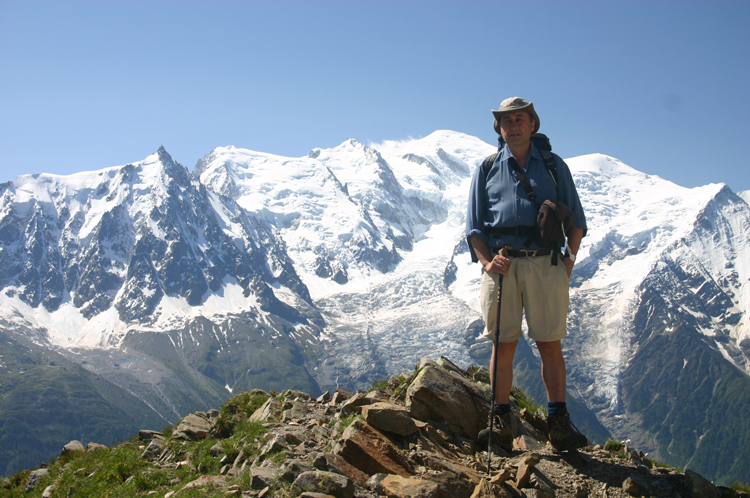 Higher-level traverses, less-walked and with superb scenery and views of Mont Blanc. Le Brévant: A good walking peak at the far south of the rouge, but accessible by cable car from Chamonix so seldom peaceful. Great walks on the high ground around it - start here and walk away! 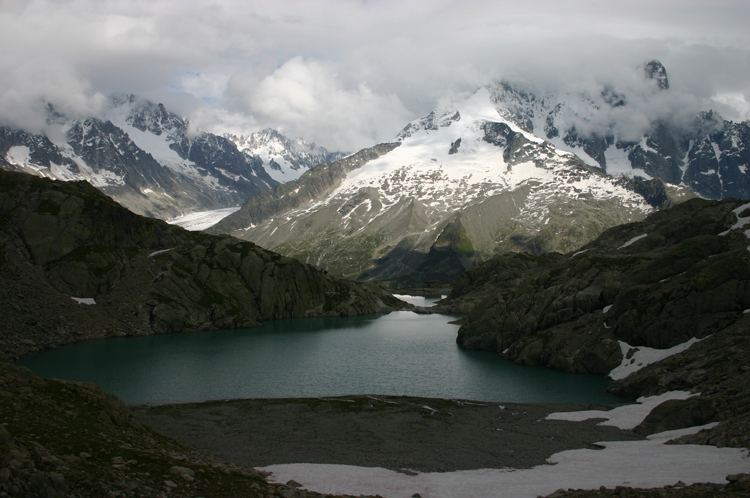 See our Lac Blanc and Southern Aiguilles Rouges Traverses page for more detail. 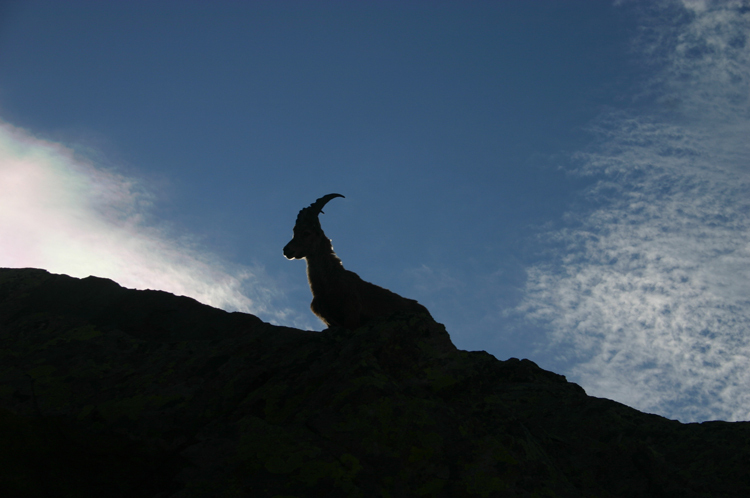 I did several other hikes around La Clusaz. I can recommend a terrific B&B chalet at La Clusaz. There are two rooms each with two single beds run by a delightful couple Chantal and Joel Collomb-Patton. It's called La Trace. www.laclusaz.com > se loger > chambres d'hôtes. 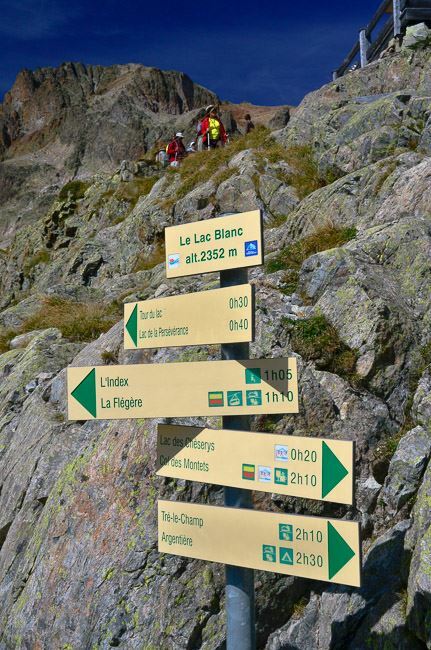 It's a bit far from Chamonix but it has some terrific hiking paths although not as dramatic as Chamonix.